Explore, experiment and create, based upon the book The Artist's Drawer by Joan Barrets and Anna Terricabras. Repeat the workshop: Saturday 10th October 2015 REGISTRATION OPEN! What might we find when we open an artist's drawer? Boxes, drawers and windows have this in common; you never know what's hiding there, inside or behind them, until you open them. 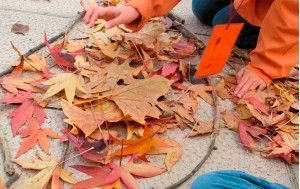 A workshop in which we learn all about Land Art, and experiment with natural materials. Part of the workshop will take place outside the ACVic buidling. By Bruna Sadurní, with the collaboration of Bruna Dinarès and Elisabet Wenceslao. Advisor Assumpta Cirera-Tuti. Children over 3 years, along with their adults. Registration until Thursday 24th September 2015, either by filling in the form, or by calling 93 885 37 04. Limited places.